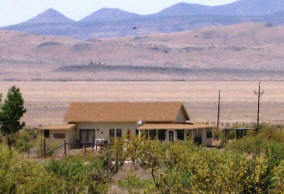 Casa Mano Prieto is nestled near the Puertocitas and Mano Prieto Mountains seven miles south of Fort Davis. The 1350 square foot guesthouse has a large living/dining area with high ceiling, two bedrooms, one full bath with shower/tub, complete full-size kitchen, and breakfast nook. One bedroom has a queen-size bed; the other has two twin beds. In the living room, there is a queen-size futon. Six is the maximum number of guests. Outside is a gazebo for morning coffee or evening cocktails. For nature lovers, there is a 3.5 mile walk around the area. Sunrises and sunsets are spectacular in this area. For stargazers, the dark, starry skies are perfect for viewing.